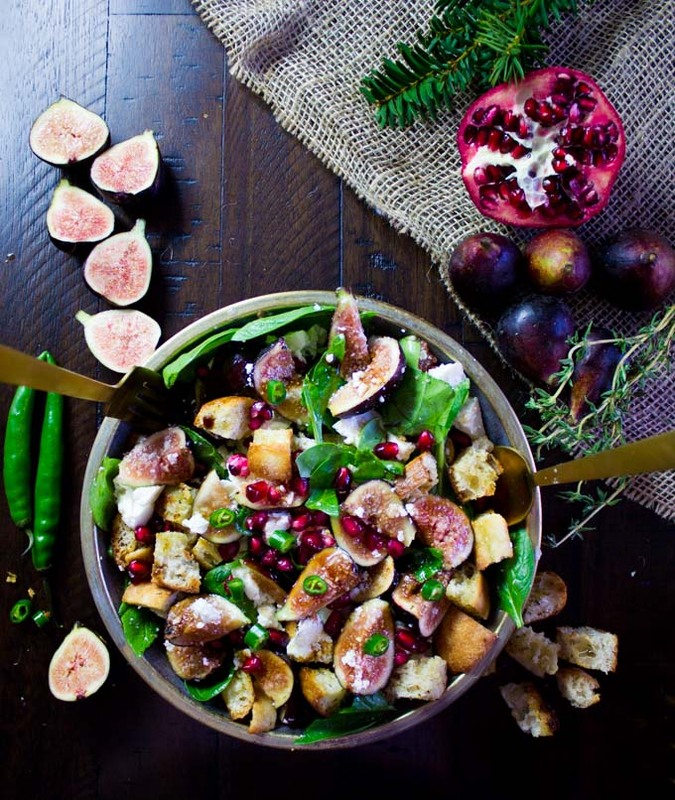 This Bread Feta Salad with Figs, Spinach and Pomegranate Dressing is the best example of simple gourmet. There’s nothing fancy about the ingredients, in fact they’re too simple. But when combined together, they’re magical! 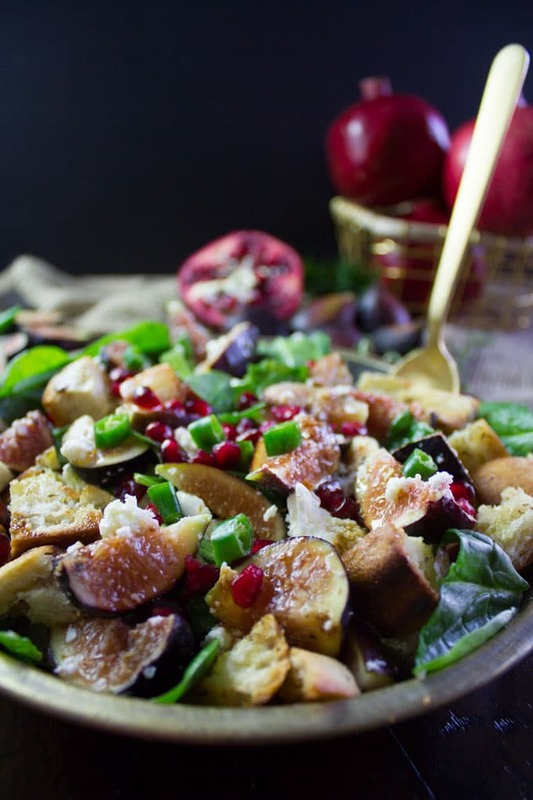 Crunchy bread chunks, sweet fresh figs, tangy feta cheese, spicy chilli peppers, spinach and a sweet pomegranate dressing. 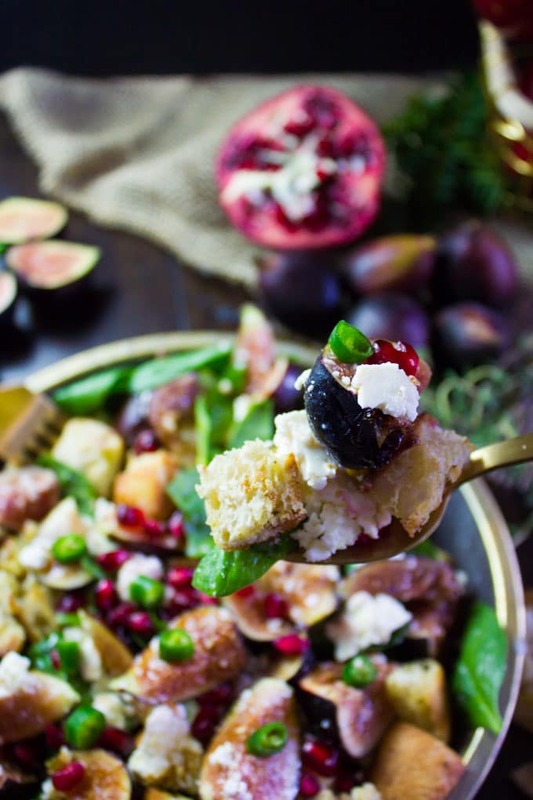 It’s a treat, it’s hearty and certainly the most delicious salad you can ever have!! That combo is irresistible. My Beloved grandpa made this feta salad so very often for us. While figs are such a treat here, they’re obviously seasonal. So often times we had this salad with tomatoes. Yes. Good old tomatoes. Chopped up into rustic inch cubes, juicy sweet and perfect. The combo of tomato and bread is probably common in Italian cooking too, and it’s absolutely delicious! Today’s feta salad just brought so many memories. So many. Memories of my grandpa, big family gatherings, lots and lots of food. My grandpa was a bubble of energy, an avid lover of nature and gardening, and a passionate foodie! He loved creative type cooking, while my grandma only made classic old fashioned meals. So she almost always kicked him out of the kitchen lol. She just didn’t approve of his meals and his creativity. And he never gave up. I remember just watching this and thinking, well grandpa is right! lol We can’t be eating the classics over and over again even if they’re made so perfectly well. Now back to the feta salad. My grandpa loved nothing more than crunchy bread. Soft pillowy melt in your mouth all that stuff was almost nauseating to him lol He wants a real crunch and texture to his bread. Spice was something he couldn’t do without either. Chillies were like salt and pepper, they were the only seasoning he used. And finally the feta, well it was his favorite cheese. So hence he came up with this bread feta salad. When it comes to the dressing, sometimes a good squirt of lemon juice and or orange juice combined with olive oil is SO good that you can skip a dressing. 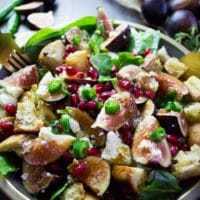 However, using pomegranate molasses, a squirt of lemon juice and olive is the absolute and simplest way to dress this salad up. If you’ve never met pomegranate molasses before, may I say you are missing out! And also, this is a perfect opportunity to meet up. I’ve made those Pomegranate Roast Lamb Shanks using pomegranate molasses and there’s also a homemade recipe on that post. It’s found in the ethnic aisle of most grocery stores, but it’s much easier making it at home. It’s basically boiled down pomegranate juice with a bit of lemon juice. Think of it like a Balsamic reduction. One I use in this Rainbow Power Grilled Haloumi Salad , which is also simply boiled down balsamic vinegar. Both the pomegranate molasses and balsamic reduction are like sweet fruity tangy syrups that have a ton of sweetness and flavor. So they take your average dressing up to another level. Today’s feta salad needed a bit of extra tang, so I thinned out the pomegranate molasses with lemon juice. You can totally use water if tang is not your thing. 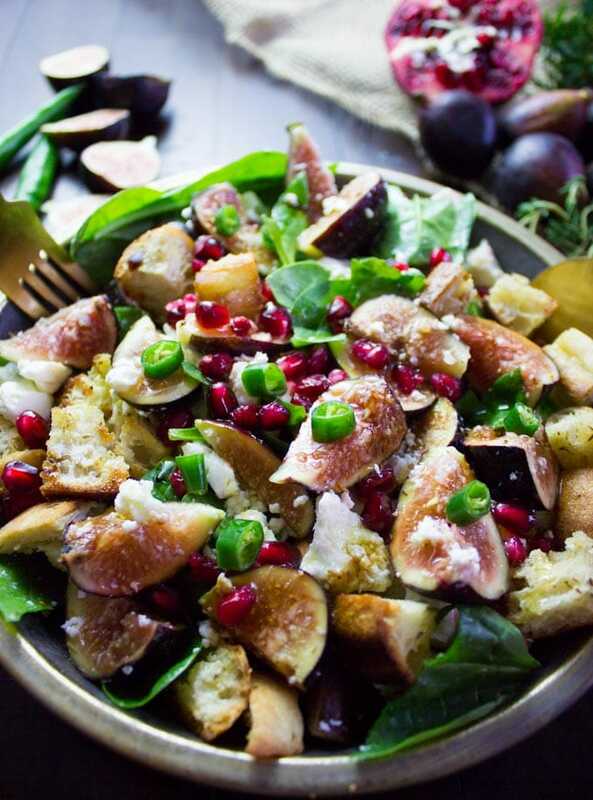 This Bread Feta Salad with Figs, Spinach and Pomegranate Dressing is the best example of simple gourmet. There's nothing fancy about the ingredients, in fact they're too simple. But when combined together, they're magical! Crunchy bread chunks, sweet fresh figs, tangy feta cheese, spicy chilli peppers, spinach and a sweet pomegranate dressing. 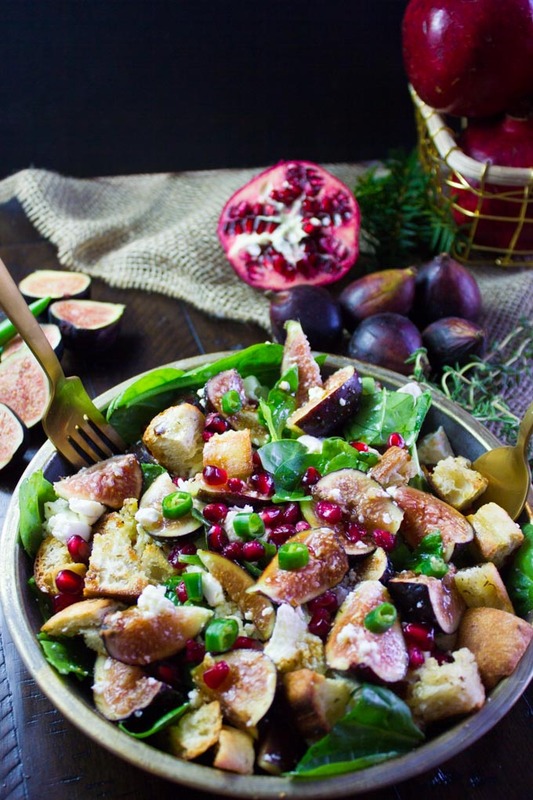 It's a treat, it's hearty and certainly the most delicious salad you can ever have!! Preheat the oven to 375 F. Start by making the crunchy bread. Line a baking sheet with parchment paper and add in all ingredients. Mix them well and toss the bread well with all the spices and oil. Bake in the oven for 8-10 minutes until slightly golden. It will crips up more as it cools down, so don't wait until it's fully crisp in the oven. Cool on the tray for a few minutes and then add them to salad. For the Salad, mix all ingredients together. Add in the bread cubes.